If you want to know about the progress Jacob pre-school: Jacob’s early development. We continue to learn much from Jacob, a kid with Down Syndrome. 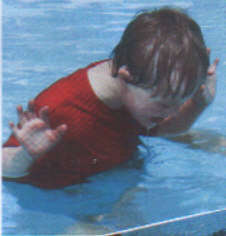 This page is a bit different to most of our Down Syndrome web site here at www.cdadc.com . Whereas most of our Down Syndrome web site is devoted to the treatment and improvement of those with Down Syndrome, this page is about Jacob and his refusal to accept the limitations that Down Syndrome and other peoples perceptions of him being limited because of the Down Syndrome. He is a genuine Aussie Battler. Day Care is now behind him. Jacob attends normal school and is achieving to his level of ability, with the assistance of support workers in the classroom and play ground. Jacob has received two young achiever awards in school and he has only been there for about 12 weeks. He is a very lovely boy who is well liked for the most part and attends many birthday parties for kids we didn’t know – but they knew Jacob and liked him enough to invite him. Speech is still very behind – we have now found out that he may have nerve deafness in one ear. I think the expert who persuaded us against sign language at the start had issues himself – we see sign language now being used with ‘normal’ babies to foster communication at a much earlier age. What can I say, we do what we can with the information we have. In the words on Jean Leuque Picard, as he consoled Data, you can do everything right and still lose. That’s life. We are now using signing with Jacob along with the English and both are now picking up – they seem to compliment each other. The vinpocetine was a flop. Jacob has now completed six months of school and we are now one week away from the Christmas vacations. Jacob has loved school even more than he loved day care. His toilet training toilet timing is now almost complete and his school support workers appear to be doing a really good job. We are very pleased with the way his primary school have so far integrated him in – and has even included Jacob in after school activities; a fitness program! He received a reading achievement award from the Premier of South Australia during this school term. Has picked up many signs and verbal words. We were all on TV recently – courtesy of Jacob. Apparently we were filmed walking out of the local cinema. We missed seeing ourselves on TV, but were told by others at his school that we were on TV. Some of the very unique and rare qualities typical of Down Syndrome is something I have only really read about, but I am only now beginning to understand what the writers were on about. Jacob is a bundle of joy. He sees things differently from us and in such a positive way, that you want to be around him just to see him smile and laugh and be amazed. In a world of the hum drum, of routine and growing up, of responsibilities and pressures to perform, Jacob gets to keep things that we so quickly lost of ourselves, things I think, deep down, we wish we didn’t. Akin to Peter Pan. Things like showing real excitement, real pleasure, being able to unreservedly laugh out loud and see the funny side. Jacob has used up more than his share of the families resources by a long way, as do most people in Jacob’s situation I guess, but he gives back to us and gives us all joy. When Chris put up our Christmas tree, decorated the house out, he was pleased to receive the “wow, this is great” stuff from us, but it was Jacob he really wanted to see the reaction of. 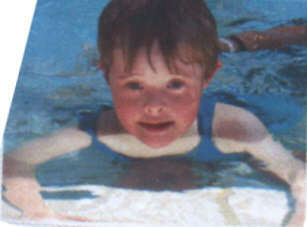 In a way, I feel very sorry for families that lack a kid with Down Syndrome, they will never know what they are missing. Carolyn saw one family greet their returning sibling at a bus stop, the whole family appeared to be there greeting his return – they were all adults, but the great love and joy at having this adult ( with Down Syndrome ) return meant an enormous amount to them. Perhaps he’d come back for a vacation, that was the impression, but we will never know, but they had something very rare and important, a one in 800, a kinsman with Down Syndrome. That uniqueness that we have in being able to share Jacob amongst ourselves for a handful of years, is something this family has had for maybe two or more decades. I can understand why some cultures highly venerated people with Down Syndrome as being gifts from the gods – they give us so much. Jacob, a kid with Down Syndrome – his progress in a normal school. Jacob has now completed 12 months of schooling in a normal school. He is progressing well. His reading and writing are advancing, as his counting with numbers. Of some note is that Jacob, in the last two weeks, has spontaneously begun drawing heads with faces – head, eyes, mouth and nose. Up until recently his drawings had shown little cognitive advancement, essentially just squiggly lines for the most part. His toileting is also improving markedly. His speech is becoming more spontaneous and more discernable as understandable English. For example, when looking at his brother with his hair sticking in all directions, he said “Look at your hair” with a big smile on his face. On another occassion, I tried to get him to say “Honk, honk.” which he refused. A few minutes later, he drove up on his battery batman quad, stopped in front of me, looked me straight in the eye and said “Toot, toot.” ! On another occasion he came running into the lounge room and Carolyn asked him what he wanted, and he said “A different DVD”. When I do the reading exercises with Jacob, he is obviously picking the reading up, so I know he will be reading more full on. His difficulty in pronouncing words is still very very evident – at times he tries so hard to tell us things, but can only come out with words that are incomprehensible. With counting, he can count to about 5. I recall one lady who spoke about her intellectually delayed daughter, she said her daughter would have the lights go on – meaning, although she may be slow, she is going to get there, her brain will work well enough and she would be able to look after herself in every way. The idea of the “lights turn on”, is pretty much what I’m currently seeing in Jacob right now. His behaviour is very age appropriate in just about everything. All that ill health early in life has paid off. His immune system has kicked in and he is experiencing a level of health unheard of before this year. Other kids are falling sick around him at school, but he’s not getting the bugs. The good health he is now experiencing may be playing a vital role in his cognitive development as well. It’s hard to learn and develop thinking skills when your sick. At this time he is on NO supplements of any sort and his blood tests are coming back fine – the blood tests have been showing his blood levels to be normal for some time now. He sat and completed a normal hearing test using head phones, was able to follow the instructions the hearing specialist gave him and has normal hearing in both ears. We are about to get his eyesight checked out. It’s an educational functional sight assessment. The first day he is observed in school, which has happened, then the assessor comes back in about two weeks with tests to check some things out that she may have observed to be possible problems with his sight and she continues to observe Jacob for four more days. Then she reports back to school and to us on the day after she completes the observation and testing. It is an astounding assessment which takes days to complete, but at the end of it, if there is any problem with his ability to learn because of his eyesight – which is highly possible with the Down Syndrome even though he doesn’t seem to need glasses – she will provide us all with directions on how best to teach him, taking into account any visual problem he may have. A FIVE DAY ASSESSMENT! We have noticed that Jacob hasn’t been invited to birthday parties and he seems to have trouble interacting with other kids. His speech is obviously an issue. Another part of that speech difficulty is that if there is an altercation at school that includes him, he cannot defend himself with words or express himself. To give an example, he was climbing up a steep wooden climbing incline using the iron chain to pull himself up. The chain got wrapped around his leg, another kid tried climbing it pulling the chain tighter on his leg, when he extricated his leg from the chain, he proceeded to push the kid. The teacher put Jacob into time out because she didn’t know about the chain wrapping round his leg ’till I told her. You see, Jacob just went quietly into time out. Although the parties may have reduced, Jacob does have a group of friends that he plays with at play time, so he is still involved in mutually beneficial social interactions with other kids. Jacob’s visual educational assessment was completed. Jacob’s report will arrive in about a month. From the educational review meeting with teachers etc, the assessor of Jacob’s visual functioning stated his eye sight appeared quite good in comparison to most kids with Down Syndrome, as well as in comparison to most ‘normal’ kids. She thought though that Jacob should have his eyes checked out just to be sure and she suggested some specialists in Adelaide we could try. The assessor did find some problems that no one had picked up on, so it was well worth getting the assessment done. She found that Jacob has difficulty seeing educational material when there is little contrast. For example, if the book on the reading easel / whiteboard is surrounded by other bits of paper or writing or pictures, then Jacob doesn’t discern what it is he is suppose to be looking at – to Jacob, the book is blending in with the back ground. Secondly, Jacob’s peripheral vision, side vision, is not to good. What this means is that if someone throws or passes him the ball when he is not looking in their general direction, he wont see it, even though most would. If someone waves to him from the side he generally wont see it either. Likewise, in learning to cross roads, he has to look both ways fully, as he wont see a car in his side vision until it is too late to protect himself. So his visual assessment has proven extremely valuable and may be responsible for saving his life and helping him to read and so on. All these major problems the Down Syndrome causes, yet he seemed to everyone to see just fine. Still doesn’t need glasses! Jacob has certainly been picking up some skills. As they grow older, kids with Down Syndrome become physcially capable of doing things before their cognitive abilities catch up. For example, with the cost of electricity and gas we installed a wood burner for heating. We paid for the kidproofing of it and so on. Two years later: This morning we found out, after Jacob had gone to school, that he had climbed over the safety barrier, opened the firebox, thrown part of a book in, closed the firebox fully, then climbed back out. Fortunately the wood was smouldering from an overnight burn, so there was no fire going, but the hot coals had burnt part of the book he had thrown in, which told us “Jacob was there”. This was after we had gone through the out of limits training with him and had a red ribbon round the security fence to remind him it’s a no go area. It’s the same with fencing the yard, one moment everything seems fine, then in a blink of an eye a way out has been found. A barrier that has worked fine for six years is suddenly climbable. So an even higher kid proof barrier had to be built last weekend. Jacob can now unlock doors with keys, so every key has to be kept out of locks and up out of reach. It’s not that they are trying to run away, it’s just that they pick up on there’s more to see when the opportunity to get out is there. kids with Down Syndorme want to explore like any other kid, but the self protective behaviours which similiarly aged kids have just aren’t as developed in our kids with Down Syndrome. Our Down Syndrome association has also commented on the need to keep our kids with Down Syndrome locked in for their own protection. Jacob’s growing independence skills also now extends to unscrewing lids on soft drink bottles. We have lost about 8 litres of soft drink this way in the last five days! Jacob is also demonstrating his understanding of things better. For example, he alligned 5 items on the floor, called us in and said “Five”. Jacob is also imitating enormously, not just words, but actions. So he is happy to dance and try copying what the other kids are doing. Unfortuneately he saw a kid mooning another kid while he was at school, then Jacob proceeded to moon his brother when he got home. Learning wise, it’s like he has hit hyper drive. I recently received a survey from a student studying Down Syndrome, so I thought I’d include the answers here, along with the questions I was asked, as it provides a quick snapshot of how Jacob is currently doing. 1) Does Jacob relate well to the other kids in school? Yes, like most kids, he has a group of friends that he is part of – they are boys that like the rough and tumble warrior like play, so they meet down one end of the oval and play together. His support person tells me it is really nice to see them all walking in at bell time with their arms round each others shoulders in a line. 2) How does Jocob relate to his teacher? He gets on well with his teacher and support workers and isn’t afraid to put his hand up and ask to go to the toilet – in sign language and normal language. 3) Does Jacob complete a full school day? Yes, he completes a full day of school, just like everyone else. 4) Does Jacob enjoy school and does he miss it during the holidays?Jacob enjoys school, but mostly he prefers home to school – school is a lot of work, while home is a lot of play. 5) What are Jacob’s favorite subjects? Reading, with writing coming up second – can use full stops now, with maths probably around last. 1) Does Jacob enjoy playing with his siblings? Loves it. 3) Does Jacob dine with the rest of the family or does he prefer to eat alone? Don’t think he prefers one way or the other, he eats with the rest of us, except when he gets hungry and wants something to eat at an odd time. He will often go to the fridge and get what he wants, or ask us if he wants something else that he cant get himself. Just like our other kids do. 4) Is bedtime difficult or does Jacob welcome it? Well, the answer to this would be different from one time frame to the next, but at his age, he definitely wants to stay up as long as he can and watch dvd’s. There is a bed time routine that he has established, which starts with us telling him it is BEDTIME and carting him off to bed. He is just like any of our kids at this age, except the ability to reason with him is a bit more difficult. 5)Does Jacob take part in and enjoy family chores such as cleaning and tidying? If so which is his favorite and which chores does he dislike?Jacob doesn’t have set chores, but he is expected to help with cleaning and tidying of his own messes. Jacob is also volunteering to help from time to time with the general chores – he is growing up. As an adjunct to the above answers, I would also add that Jacob is generally well liked by his class, teacher, support workers and Down Syndrome workers. Most adults find Jacob a pleasure to work with, because he is eager to learn and has a charming disposition, plus a smile that can endear him to anyone. Many comment on his long attention span, which I reckon is partly due to our massive 6 foot fish tank and, his good problem solving skills are often commented on also. Although raising Jacob can be much harder than with our other kids, because of the Down Syndrome, particularly with care and protection matters, I look at him and see my real little boy who is growing up like my other kids and hope he will one day be able to father his own kids, which is another thing the Down Syndrome will try and take from him. As a father, I want to say that it is also a great pleasure to hear the manly things that my son does – ok, he plays with his sister’s toys sometimes, but he loves the manly push and shove games, wrestling in play and watching it on TV 🙂 and so on. When we bought a 6 foot – 2 metre – high Spiderman soft toy, we sat it on a chair in the lounge. Everyone enjoyed having the oversized spiderman sitting with us and some of our kids would sit on Spiderman’s lap and watch TV, Jacob would often sit on top of spidermans shoulders, as if he were being piggy backed. On numerous occassions, Jacob has pulled Spiderman off the chair, pulled one of Spiderman’s legs up and insisted we do the three count, declaring Jacob to be the winner. Yes, he is a real SON, even though he has Down Syndrome. It’s now so close to Christmas and the end of the school year, that I decided to update the page now. For those of you who are following Jacob’s development with Down Syndrome, you will be happy to know that he is now learning to spell words. His Down Syndrome worker was so impressed with his reading skills and his skill in selecting words to make a sentence using a computer – Jacob even included the full stop! – that she believed Jacob was ready to start learning to spell. Our Down Syndrome worker will be even more surprised to hear, that no sooner than he was exposed to spelling in his curriculum, that he was successfully spelling and sounding out words from his reader at home! For example, d-o-g and a good, if not correct attempt at t-a-b-l-e . That will be the big memory of this year of school, Jacob learning to spell the words and sounding them out. It will also be remembered as the year he became so confident in his relationships with his other schoolfriends and teachers, that he entered into proper reciprocal play, even if it did push the limits with his teachers a bit! TO give an example, he loves playing a chasing game with his friends, they ran into a toilet block, but Jacob decided to stay in there. His support worker came over, being a female, couldn’t go in after him, so she had to get a male teacher, the male teacher went in and Jacob locked himself into a toilet cubicle, so the teacher had to find a teacher with a key. He has repeated this at least once and obviously sees it as a game to play with teachers, even if it may exasperate them, it is a good sign. On another occasion, again quite recent, he hid behind a tree when his class went out to do some PE – physical education – when his support worker came up to see what he was doing, he said he was “hiding”, playing a game with his teacher. So Jacob is spontaneously engaging in play with people, often in a lovely joking manner – he hid from the teacher and was waiting for the search response. The most difficult event, again in play, was when Jacob pushed a pair of open scissors onto a kid’s waste, no one was hurt or anything, but it did rattle the cage so to speak. 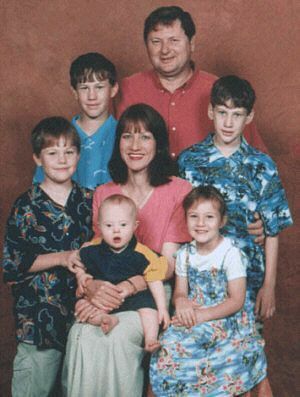 Was this a Down Syndrome thing – NO, it was not a Down Syndrome thing. Having raised a number of kids, it is normal growing up learning type behavior! The school of course is doing the right thing by giving him timeouts, so that he learns to curb his enthusiasm and realises appropriate from inappropriate behavior. Merry Christmas and here’s some photo’s of Jacob taken during his time at school this year, 2006. 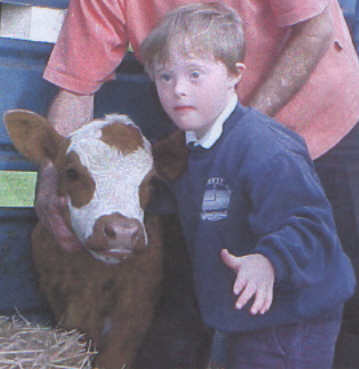 When farm animals came to the school, Jacob was eager to give a calf a pat. Apart from Jacob, there is only one other kid in the school with Down Syndrome, though approximately 10% of the school students have a disability. 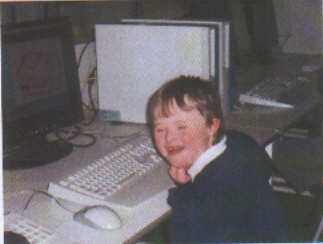 Jacob on one of the school computers – the Down Syndrome may slow him down, but he keeps on going and he loves computer games with a passion. 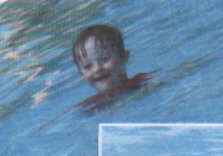 Jacob went to swimming classes with the rest of his school class. 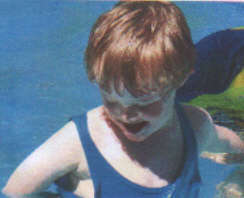 As you can see from this picture and the ones below, he loved the water activities and thoroughly enjoyed himself. Down Syndrome does not mean that the kid has to be excluded from school activities, it just means that the school has to be caring enough to want to integrate and assimilate, while the Education Department supports and finances the school to be able to do it. We regrettably cannot show Jacob with his school class, nor with his school friends, as in Australia the taking of photo’s of kids other than one own, may lead to serious legal repercussions. So, although I would have liked to include photo’s of Jacob in the school Christmas play – he was a reindeer – or crossing over the oval with his friends arm in arm, even though such photo’s would be so innocent and precious and beautiful, they are too risky under Australian law to put here, unless I had parent permission. The difficulty in obtaining parent permission, is that Jacob cannot yet tell me the names of his friends – just to write Christmas cards means we rely on the school to provide us with the first names of the students in his class. In America, the law is, that they basically ban the use of any photo that can identify a living person, unless the person and or parent and or guardian agrees to the image being used. Newspaper reporters/photographers may be exempt to some extent.